Start hacking regularly, whenever possible. Plan on minimum of 60 minutes out for each hack, 2x per week. Pull shoes, if all goes well, and get back to barefoot. Continue schooling under saddle, fine-tuning dressage. IF jumping is a go, jump 1x every two weeks minimum. This should be do-able! Good job planning, me from the past. 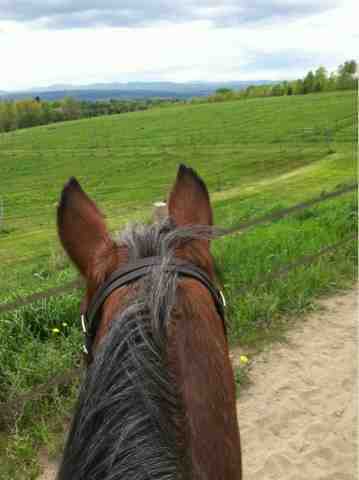 Jumping will be attempted as soon as my jump saddle is fit: right now, it’s looking like April 21 for that. Hacking will commence in earnest this Thursday, 4/3. Dressage is already being fine-tuned. Probably I’ll be headed to Everything Equine instead of the Mud Ride: Tris is going to be a school horse for the local university’s IHSA mock show (just the riders on the team, which is new, getting used to the style of an IHSA show) on 4/26 and he’s not quite fit enough for 15 miles anyway. Talked to the farrier last night about pulling shoes and going barefoot, so we are on track for that. It’s a very low bar of goals, but I’m happy that it should go well anyway! Previous Post Poetry Month, Day 1: Robert Frost’s "The Runaway"
Next Post Poetry Month Day 2: Rudyard Kipling "White Horses"
Sounds like a very doable list of goals! Sounds like a fun time of things.